Diarrhoea is not one of the more well-known flu symptoms, but it can occur if you are already susceptible to digestive complaints. It is important to remember to keep hydrated and to rest during this time. 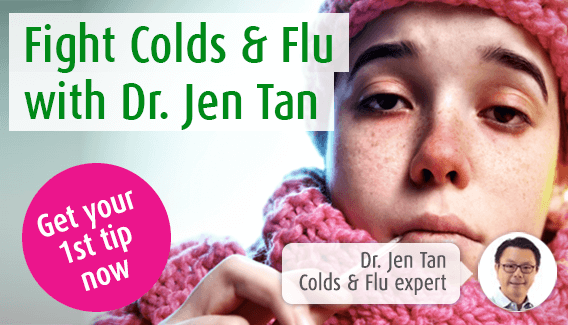 Our immune system expert, Dr. Jen Tan is on hand to examine the causes of diarrhoea during the flu, and to recommend a variety of herbal solutions. Diarrhoea is the passing of frequent watery stools. Although it is not the most common symptom of the flu, it can occur with many viral infections, and can leave you feeling weak and dehydrated. Generally speaking, diarrhoea associated with the flu should clear up within a few days, but if it lasts longer than this, it may be worth seeking medical attention. Why am I experiencing diarrhoea with the flu? The flu can cause diarrhoea, particularly in children, or those who already suffer with digestive disorders, such as diverticulitis. It is more commonly seen with swine or avian flu. When you are unwell, your digestive system can become more sensitive and less able to properly break down food and absorb nutrients efficiently. This can result in diarrhoea as food and fluid passes too quickly through the bowel. While the last thing you probably want to do when you have diarrhoea is to eat and drink, remember that severe diarrhoea can cause you to become very weak and dehydrated. It is important to drink plenty of water as you are losing a lot of fluid through bouts of diarrhoea. Even if you have very little appetite during the first couple of days, try to eat a little dry bread or toast, to keep your blood sugar levels up. Some plain yoghurt should not aggravate your condition, and may even reduce symptoms of diarrhoea. It is important not eat sugary foods, fatty foods, or those which will aggravate an already sensitive digestive system. Give yourself plenty of rest, as diarrhoea can cause you to feel weak. Exerting yourself while you are suffering from flu and diarrhoea will slow down your recovery. The most effective herbal remedy is one which will support your immune system, helping it to fight off the flu virus. For example, licensed herbal product Echinaforce® Echinacea tinctures or tablets, contains fresh extracts of the Echinacea plant, a plant which has long traditional use in aiding the function of the immune system, helping to prevent infection or to shorten the course of illness. Additionally, some people find Tormentil effective. It is a herb which has traditionally been used to settle an upset stomach and to ease diarrhoea. It is one of Alfred Vogel’s original formulations, available in tincture form. Are there conventional medicines to help with diarrhoea? A doctor is likely to be concerned that your diarrhoea is causing you to experience dehydration. The risk of this is higher in children, the elderly, or after prolonged bouts of diarrhoea. If this is the case, he may recommend,an oral rehydration solution which will replace essential salt, glucose and minerals. Anti-diarrhoeal medications may also be recommended, particularly if your diarrhoea has persisted for more than a few days. They work by slowing the movement of muscles in the gut, and usually help to shorten the duration of your diarrhoea by around 24 hours. In order to help you to fight off the flu, your doctor may suggest an anti-viral drug, Oseltamivir or Zanamivir. However, this treatment is not appropriate for everyone, and you should discuss with your doctor the possible side-effects.